Did the 1986 EDSA Revolution Make a Big Difference on the Economy? It may be hard to believe now but until the late 1960s, the Philippines was considered one of Asia’s economic powerhouses. No wonder the Asian Development Bank (ADB) was headquartered in Manila when it was established in 1967. Back then, the Philippines’ real (or inflation-adjusted) per capita GDP, a measure of average economic output per person, was the third highest in Southeast Asia – behind Singapore and Malaysia but ahead of Thailand and Indonesia. 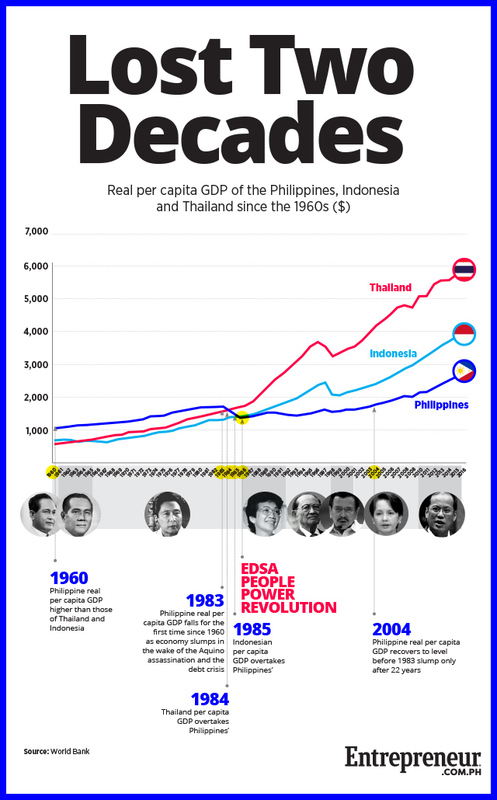 Thailand’s GDP per capita in the 1960s was only $571 in 1960—almost half of Philippines’ $1,059. Indonesia’s was $690. Related story: How Did the Declaration of Martial Law in 1972 Impact the Economy? It became worse in the following years until 1986, when the steep drop reversed in the aftermath of Marcos’ ouster in February of that year. However, Marcos’ downfall and the restoration of democratic and civil rights, did not translate to rapid economic recovery. Because the administration of Corazon Aquino and her successors prioritized the payment of foreign debt over spending for crucial infrastructures and social services, economic growth was slow to pick up. In fact, the Philippines’ real per capita GDP surpassed its pre-1983 crisis level only 22 years after. It was only in 2004 when the country hit $1,768 GDP per capita, finally exceeding the previous peak in 1982. By then, it already lagged way behind its neighbors, particularly Thailand and Indonesia, which were growing faster mean time. As of 2016, the country’s GDP per capita stood at $2,753, less than half compared to Thailand’s $5,902 and just a little over two-thirds of Indonesia’s $3,974.